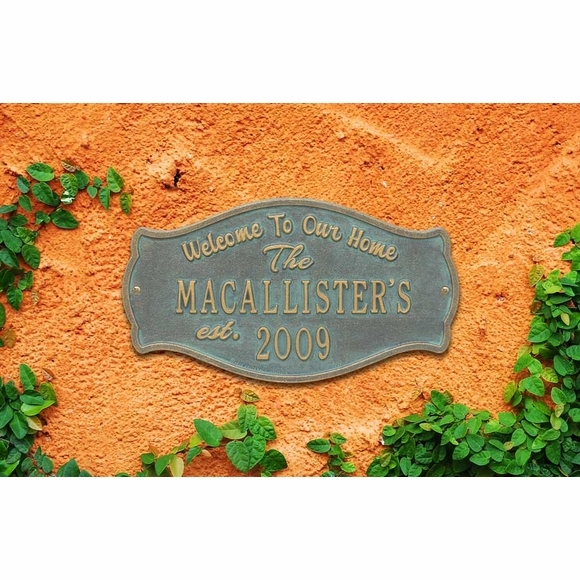 Welcome To Our Home Plaque - - a sophisticated sign that welcomes guests and displays the year your family was established. Makes a great personalized housewarming gift, wedding gift, or anniversary gift. 15.5" x 5.75" arched rectangle. Wall mount. Made in USA. "Welcome To Our Home," "The," and "est." are a permanent part of the design. Line 1, the family name, holds up to sixteen (16) 1.25" characters. Line 2, the established year, holds up to four (4) 1.25" characters. Large image color is bronze verde. Smaller images colors (from left to right) are antique brass, antique copper, black/gold, bronze verde, oil rubbed bronze, bronze/gold, and pewter/silver. Dimensions: 15.5" x 5.75" x 0.32". Sophisticated Welcome To Our Home sign that greets guests and displays the year your family was established. Makes a great personalized housewarming gift, wedding gift, or anniversary gift. Made in USA.